This year's Indian Science Congress (ISC) was held in Phagwara, Jalandhar, in January 4-7, 2019. This messy annual ritual of India's science outreach frequently draws a great deal of topical heat and dust, and many people suggest ignoring most of it. However, there are related larger issues for which the science congress provides a convenient symbol, and they are perhaps worth discussing, and worrying soberly over. 'A professional body under the Department of Science & Technology, Ministry of Science & Technology, Government of India'. Also, all prime ministers of independent India have annually spoken at the Indian Science Congress, something quite unusual in the global context. As a result, it is instructive to look at both what they say and what they do not. More specifically, it is interesting to look at what the current prime minister said, and what he did not. These speeches are, of course, set pieces of formal ceremony, so it is unexceptional and unsurprising that this year's speech, like its predecessors, lauded science and technology, scientists and technologists, and assured its audience of continuing governmental support for science and technology. However, a closer reading of the speech on the official website of the GoI provides grounds for fundamental worries. This is how the earlier version of the speech was listed in the GoI website which has been edited now. It is both easy and correct to dismiss this as simply the sad effort of some hapless minion in the government bureaucracy trying their best. However, it is worth asking what significance science carries for the GoI if it saw this as sufficient copy-editing for what is apparently a verbatim transcript. Symbolism matters. “Friends, 2018 was a good year for India science. Among our achievements this year are the production of aviation grade bio-fuel, ‘Divya Nayan’ a machine for visually impaired, inexpensive device for diagnosis of cervical cancer, TB, dengue. A real time land slide warning system in the Sikkim, Darjeeling region. “Our scientists must commit themselves to addressing problems of affordable health care, housing, clean air, water and energy, agriculture productivity and food processing. In our country, there are large numbers of farmers who own less than two hectares of land. They need technology so that they can increase their productivity with less labour. We should focus on how to use technology related to big data analysis, artificial intelligence, block chain and communication in an efficient way with less cost in farming. So, it is the need of the hour that these all these inventions including censor technology, drone, satellite imaging and artificial intelligence should be offered in the form of a package to the farmers. Can we find a better and more scientific way to work on drought management in the drought prone areas of the country? Can we improve and reform the existing systems that forecast disasters including rain, cyclone and other such natural disasters? Can we find an efficient technological solution to eradicate our decades’ old malnutrition problem? Are these worthwhile goals? Yes. Are they all purely technological-nay-technocratic, so-called 'ideology-neutral' goals? Yes. Do they ignore (Conveniently, you say? Surely not?) the vexingly complicated socio-political issues of justice and equity inherent in the 'problems' identified, which deeply limit the utility of attractively simple-sounding techno-solutions? Yes. In other words, the prime minister thinks that the societal value of 'science' is in providing technology in the marketplace so as to make the Indian state great. Again, MIGA to match the Trumpian MAGA? Is this thinking incorrect? Not entirely. Is it adequate? No. What does it leave out? It leaves out any awareness of the complex connections between social justice and equity on the one hand, and 'science and technology' on the other. It leaves out any sense of article 51(A) of the Constitution of India as provided by the forty-second constitutional amendment, of the critical importance of 'scientific temper, humanism, and the spirit of inquiry and reform'. It leaves out any sense of how India's quintessential science outreach celebration, the science congress, can contribute to this fundamental duty of Indian citizens. Taking these various commissions and omissions in the speech together, it appears likely that the prime minister and his colleagues in the government think of science not as an internalised, evidence-based way of examining and thinking about the world that contributes to the empowerment of citizens, but only as a way of enhancing the national economy and prestige and creating technological tools for the marketplace. It is no wonder that the speech identifies, correctly, the origin of the slogan 'Jai Vigyan' (Hail Science) to be the Pokharan nuclear weapons tests; the meaningfulness of 'science' appears to be in its technological contributions to the Indian state. In this context, it is useful to note a curious development regarding the science congress over recent years. Who are the hosts of the science congresses? It is evident that, over recent years, so-called 'private' or 'non-state' educational organisations are increasingly becoming common hosts of the annual science congress. Now, put this together with what we know of the current state, atmosphere and perspective of these organisations, laudable exceptions notwithstanding. It is unsurprising that the temper and atmosphere of the science congresses have changed to accommodate this new reality of the state as primarily a 'facilitator' of the marketplace. Should all of this not worry us? There are a number of ways in which this should worry us greatly. Firstly, as already argued here, the misplaced devaluation of science as a producer of technologies limits its value as an instrument of empowerment. In fact, it coerces a perspective that it is not simply possible but even desirable for individuals, 'scientists', to separate and hold two contradictory perspectives simultaneously. One is their sceptical, questioning, evidence-driven approach to understanding the domains of their scholarship. The second, contradictory one is a passive acceptance of the socioeconomic and political realities and practices of their own communities. How good a 'scientist' can you be in this contradictory state? And more worryingly, how good can your science be, in the long run, for serving its true empowering potential? Secondly and somewhat paradoxically, this point of view does a great disservice to the true artistically inventive nature of making new technologies. It makes the inventor of new, 'constructively disruptive' technologies into a follower of 'science', rather than a spectacularly innovative creator, and disrespects her in fundamental ways. And thirdly, this point of view, basing the value of science and technology on their utility to the state and the marketplace, not only devalues science, it also devalues the liberating nature of inventive technologies themselves. This devaluation comes from the constraints placed to narrow the path of the rigged marketplace if they are to be available to their communities, instead of being free and open source commons as they are in their very nature. Is this correct? Sort-of-yes. Is this overstated? Yes. Should this conflation of ancient 'science' or 'research' with a contemporary value of 'science' restricted to its technological contributions to the Indian state not worry us deeply? 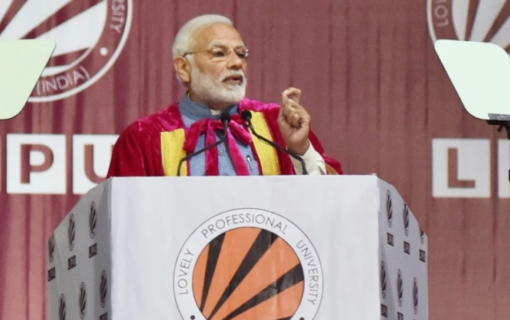 This worry becomes even more acute as we extend our perspective from what the prime minister and his colleagues said at the science congress to what they have publicly said outside it, about the claims they ascribe to ancient Indian 'scientific' glories. We have worried, and rightly so, over the many contorted exercises in pseudo-science made at this year's science congress itself. Some people, on the other hand, have worried that we are paying too much attention to these minor random irritants, when the GoI is after all supporting science, and when there are major issues like climate change to address. The Principal Scientific Adviser to the GoI has earnestly worried in a blog that we pay a great deal of attention to 'random untenable statements linking religion, culture, the past, etc. to science in an erroneous manner', whether made by politicians, lay people, or scientists. But we do not pay enough attention to the contemporary 'Gorillas' of pseudoscience, such as climate change denialism, anti-vaccine activism and the like. Sadly, for such misplaced optimism about the GoI, these are not just minor, random irritants. They reflect a version of regressive ideologies looking backwards with longing. They are part of the many manifestations of an assertive backward-looking socio-political ideology. They are part of an ideology that looks at science not as an instrument of democratic empowerment, not as an open-ended empirical quest to understand and change the world together for the better, but as a means to validate and valorise deeply and angrily held political myths about our past, and to create technologies for the marketplace without upsetting the status quo of socio-economic power hierarchies. Should we not worry deeply about this?